Hello friends, Now I am here with the favorite and the most questioned topic: works- best tips to boost Alexa rank of a website. Note: – The above tips to boost Alexa rank will work but be patient you can see boost within 10 -15 days. Alexa is a web information provided by Amazon. It allows users to find their website or blog ranking in their country and worldwide. Alexa determines the Performance and rank of the website by the number of visitors and number of page views daily. But a thing here to concentrate is how? Alexa only determines the visitors and page views which have passed through its system database, means if and only if Alexa toolbar is installed on visitor’s browser. Alexa rank plays a significant and major role if you want to monetize your blog to get a high amount of income. Because advertiser wants high-quality traffic for their advertisement. Higher the quality of the advertisement, higher you will earn. Sponsors determine the popularity of a blog or website by it’s Alexa rankings. Go to www.alexa.com. Create an account or sign in to existing one. Add your website to Alexa and verify it. 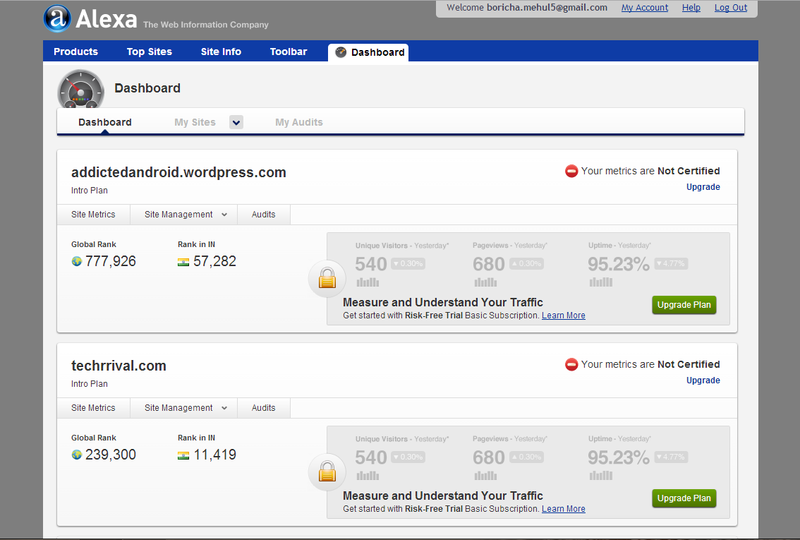 Then click on dashboard, your current site rank will be shown. This step will increase your website rank significantly. As we know that it is a very tough and maybe an impossible work to encourage all users to install Alexa toolbar who visits your site frequently. So here is a quick and easy solution to install the Alexa widget on your site or blog. This will work same as installing Alexa toolbar to all visitors browser. Alexa widget is available in different varieties and also different sizes. Install the one you prefer. 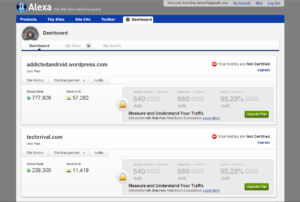 Note: – If you don’t want to show widget to your visitors but wanted to keep track of rank on it. Try the below code. Try to make quality backlinks from the websites which possess higher Alexa rank as compared to your site or blog. You can get quality Do-Follow backlinks by writing a top quality guest post on other sites and by submitting it to high ranked directories like DMOZ. Share your posts and website link on social networking sites like Facebook, Twitter, LinkedIn, Tumblr, Delicious, Pinterest, etc. Please do not SPAM or over socialize. This type of sharing leads to lots of visitors to your site and therefore a lower Alexa rank. Thank you for reading this post and keep connected to Tech Arrival to continue enjoying beautiful posts. Share your views on this post in the comment section below. If you still have any query, throw it in the comment section. I’m afraid there is no other way Manoj. Great tips for Alexa boost rank thanks for sharing nice tips. Thanks , realy nice and helpful article for me.